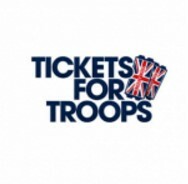 Tickets For Troops | Salisbury City FC "The Whites"
Salisbury City FC are delighted to announce a new partnership with Tickets for Troops – a charity dedicated to offering free tickets to the country’s soldiers, sailors and airmen. While the Club already grants concessions to all members of the Forces, they are keen to show support to this fantastic charity. Salisbury City will be donating ten free tickets for all remaining home fixtures, providing troops with an opportunity to enjoy watching their local team. The deal represents Salisbury City FC’s backing for the country’s Army, Royal Navy and Royal Airforce and recognition of all that these men and women do. The Club are proud to count a serviceman within their own ranks with Jason Silver, a young forward for the Whites, currently serving with the Armed Forces. The announcement follows the Whites recent participation in the Movember campaign for The Prostate Cancer Charity as well as the Club’s bid to develop links with local schools through halftime penalty shoot-outs. Salisbury City are currently second in the Zamaretto Premier League. They are yet to be defeated at the Raymond McEnhill Stadium this season.